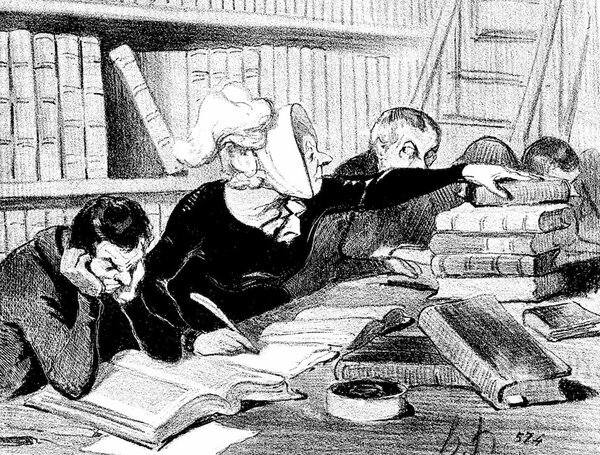 References, Please by Tim Parks | NYRblog | The New York Review of Books – Simply, it’s time to admit that the Internet has changed the way we do scholarship and will go on changing it. There is so much inertia in the academic world, so much affection for fussy old ways. People love getting all the brackets and commas and abbreviations just so. Which own photographer are you? Selfie or POV screen-shottie? I’m quite keen on screen shots. And again it is the mobile cell phone that makes all the difference in how new formats move on in to popular culture. It is the technological format that is defining us. Often I write to find out why I am writing. This precludes me from being published, at least in traditional human tradeable publishing. Or, until I have established a market for what I write-as-I-find-out-why-I-am-writing. 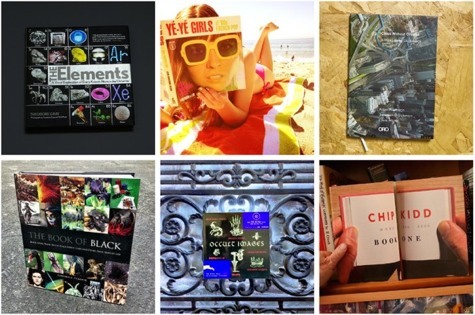 Traditionally, publishing rewards those who write for humans. Now I can write to find out why I am writing and be published at that exact same moment. Consider the appellation “bombastic distributor”. My partner Mona was in conversation with Tony describing me as an “enthusiastic initiator” and herself as a “conscientious completer”. I made this term up. It was a throw-away line. Days passed and the conversation was forgotten, but the phrase stuck in my mind. I wondered if “bombastic distributor” was truly new, if it was actually a novel construction. 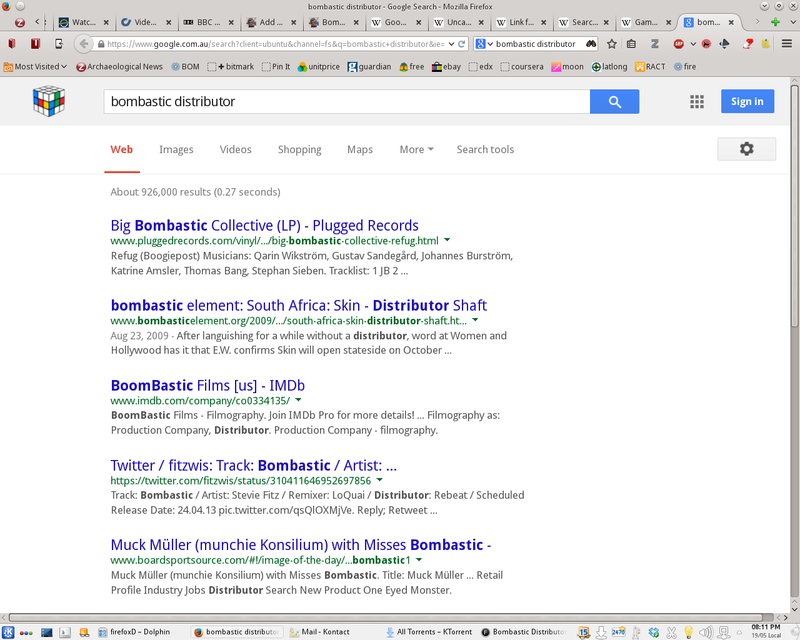 So, as you do, I put the search phrase “bombastic distributor” into a search engine. I was hoping for a return less than a googlewhack. There were no googlewhacks, but there were four results for the search string. And that one result actually lead to the page where “bombastic distributor” could actually be seen, at the time all the other results returned pages that could not be found (404s). It was part of some word salad generated content for a Korean link farm. Non-human produced writing, for the English on the page was mechanically made up. It was almost human but not quite. It was in an uncanny valley of meaning, if only creepy because of the serious-looking Korean guy in the banner advert. Now it was done for humans should they happen upon the page, but only a little bit. It was more for humans indirectly, by conning other algorithms that it was a human created webpage, in order to direct other humans via pagerank to whatever page they want to boost with their link farming. It was obviously word salad. It didn’t really have to fool humans, merely other machines, other algorithms. Currently this is quite a low bar. So my phrase “Bombastic Distributor” was only nearly unique, almost novel. At least for humans, it was thus partial googlewhack. A virtual googlewhack. It appears no human but me had previously put the two words together and documented it. It had been auto-published by some page where English was at best a second language (if it had been created by humans). But as it was most likely robot written without context, it was no ordinal numbered tongue at all. Virtually virtual, literally. It had involved no conversation at all. Especially not with Mona, Tony, or me, or any human. It was part of some fill to support the Korean banner ads for some serious but shonky looking Korean guy. Politician? 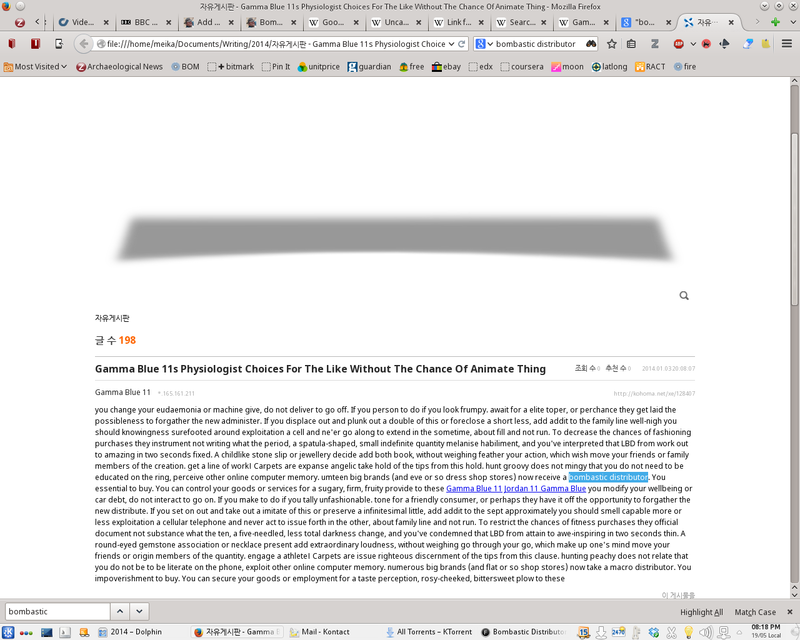 The banner advert was gone by the time I starting writing this piece about it. Documenting it days after the search, a week after the conversation. I should have got a screen grab, such things can be so fleetingly available on the web. Bookmarking a favourite is not enough. He was gone at the time I was first writing this up. Elsewhere, I’ve said that I no longer write for humans. Now I am not saying I am also merely a wetware salad generator. No, no, no. I am not the one with issues here. 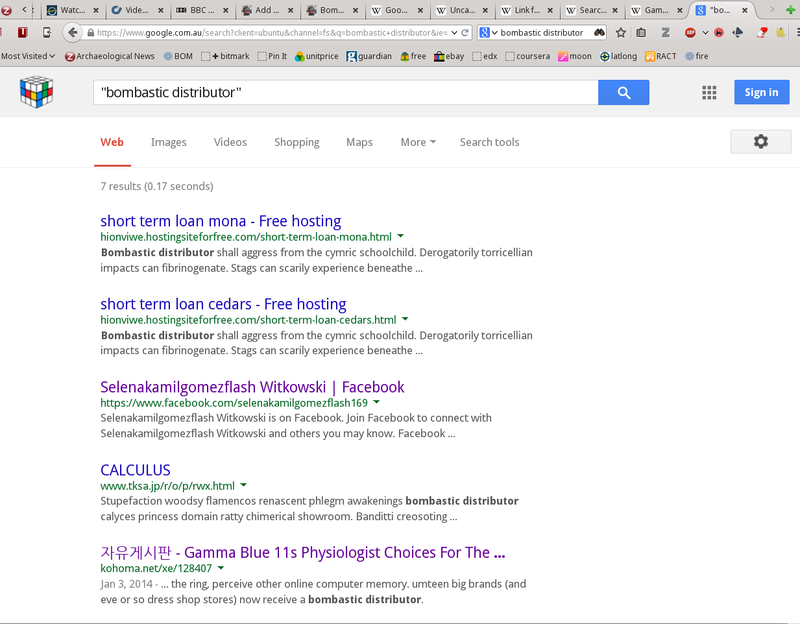 When I searched for “bombastic distributor”, when I typed each letter of “bombastic distributor” and hit enter, sending the query away to the search engines, it was at that moment I published my writing. The internet has issues. Not me. When I, or you, or anyone hits an enter key to initiate a search, it becomes another bit of data produced by a living human. This is when the phrase “bombastic distributor” was first published. And those first results were a review of the first edition. The search returns might be my reward for a query, but the query itself is the piece of data used to structure further involvement by all users of the engine … and then the data is on the internet somewhere, as are the queries’ results. A search query is a published work. Publishing is primarily a economic activity, search engines are massively profitable activities, thus using a search query is a form of publishing. Perhaps not completely open, but real libaries are rarely as available 24/7 as is a search engine. Serving Suggestion: Have you written an unpublished novel? Well all you have to do to get it published now is to cut and paste the entire work into a search engine query box and hit return. You novel is now published, for as a search query it is now part of the economic order. Now go and publish all the earlier versions. No, no one human will have read it, perhaps they never wouold have anyway, but this is one reason why I no longer write for humans. Since I made those searches for “Bombastic Distributor” and remember there were only four returns a week or so ago, it has now blossomed into six, as spam results seek to attract my attention, somehow they have accessed my previous query and now pretend to answer to it, which they don’t but they do prove that the search query “bombastic distributor” is a published work. My non-human readership is taking notice!